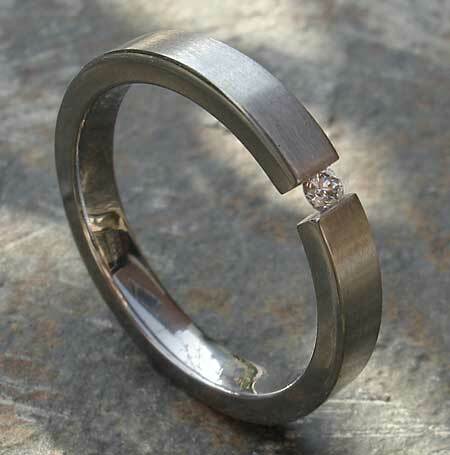 Narrow Tension Set Titanium Engagement Ring : LOVE2HAVE in the UK! Like our other tension set titanium engagement rings, manufactured from the same high-quality aircraft grade titanium, this narrow tension set titanium engagement ring securely holds the white 0.05pt diamond in place. Diamond is the hardest surface ever discovered, so can withstand the high tension required for it to sit in place, even with its narrower width. The ring itself is 3mm wide, therefore making this ring a good choice if you have smaller fingers and are looking for something more subtle as an engagement ring. Nothing quite equals having a diamond for your engagement which is why we provide our rings in many different styles to suit anyone's need. The diamond is unique from other stones, and there are many reasons as to why women prefer them above any other stone. 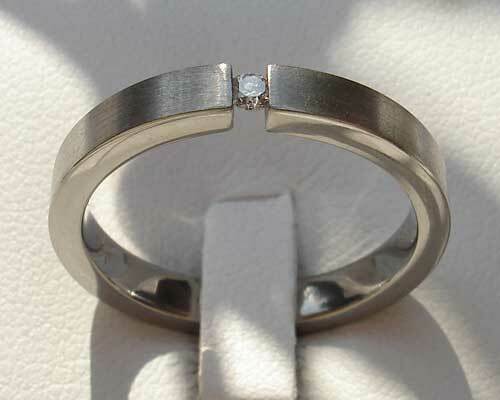 The size in depth of the diamond in this ring also allows for the thinner wall thickness, so again on smaller fingers, it would sit very comfortably. We feature the ring here in a satin finish, but polished is also available too. If you prefer this choice, please enter this information into the comments box at check out. Precious stone(s) Available: 1 x 0.05pt white diamond.